Cyclone Yasi has come and gone. It’s amazing to think that a cyclone the same intensity as Katrina has ripped through our area. But unlike Katrina, Yasi hit lesser populated areas and didn’t take lives like we saw in Louisiana a few years ago. Yasi, a level 5 cyclone, crossed land at Mission Beach leaving that community, as well as Tully, Cardwell, and several other small coastal communities, completely ravaged. One in three homes were destroyed and thousands are devastated by the utter destruction. Instead of seeing the fruit that generations of farmers have labored for we see a landscape that looks like a warzone. 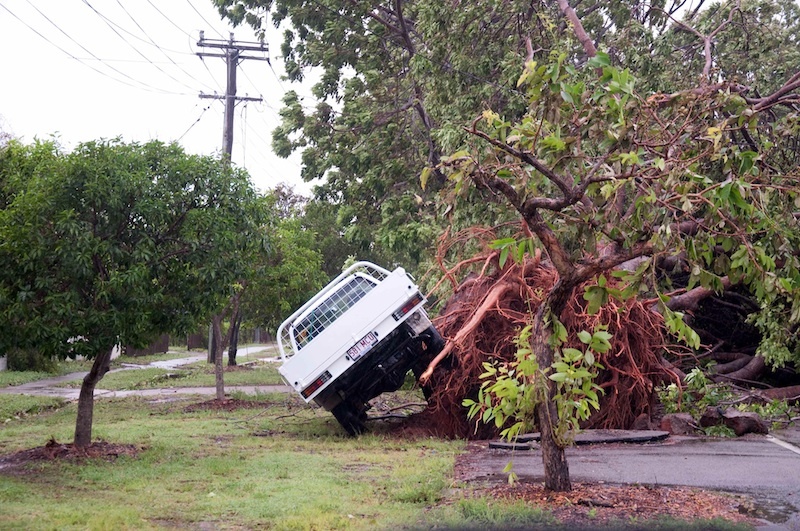 The damage in Townsville—though severe in places—was considerably less. Although there are homes and businesses damaged, it is nothing like our neighbors to the north where entire farms and communities lay in ruins. Around our home we have many fallen trees and power lines. People have been hard at work clearing their yards and the streets of debris and cleaning up homes. We’re now on day four without power. At the moment 32% of the city has power restored, including all of our friends and the YWAM base just a few blocks away as well as the supermarket down the road. We hope to have power at our place within the week. In the meantime, we take cold showers thanking God that we have running water. We cook our meals on the BBQ, thanking God for propane. We store our milk in the fridge that is now powered by a borrowed generator. We sleep without blankets in the dripping heat of the night and thank God that we are in a warm climate instead of a cold one. We listen to the battery-operated radio to get important announcements and reports of where the disaster relief is up to. And soon, we’ll head to friends houses to do our laundry, watch the news on TV, connect to the outside world online (and post this), enjoy a cup of tea, and maybe—just maybe—have an hour or two in the air conditioning. We spent yesterday cleaning up the YWAM base and our neighborhood. We spent today cleaning up our own place. Tomorrow we will rest… and then start again on Monday. Thanks for your prayers for us and for the people of our area. Although Yasi was terrifying for those caught in the eye of it, everyone rejoices that lives were spared. Homes can be rebuilt. Businesses can be rebuilt. Farms can be rebuilt. Cars and equipment can be replaced. Streets can be cleaned up. Power can be recovered. And most importantly, hope can be restored. Dear friends, please continue to pray. The clean-up and rebuilding has only just begun. Praying for you and your community. I very much understand. I did not live in New Orleans for Katrina, but lived there during Gustav and live there again now. I know so many people who experienced first-hand what you are going through. Lifting you up!